The Board of Zoning and Architectural Review has an opening for one Board member. The BOZAR meets once a month and members rotate serving on the Design Review Committee that meets twice a month. Applicants must have lived in Town for at least one year. Preference will be given to people who have knowledge in architecture, design, building, landscaping or historic preservation. Crested Butte is a growing and dynamic community. Be a part in shaping Crested Butte’s future. Pick up an application at the Town Offices’ building department located at 507 Maroon Avenue, or contact Molly Minneman by e-mail mollym@crestedbutte-co.gov or phone at 349-5338. See our web site at www.townofcrestedbutte.com. WEDNESDAY, NOVEMBER 4, 2009 ~ 5:00 P.M.
Plans for designs to be reviewed at the meeting are available for viewing in the Mt. Crested Butte Town Hall. Please take notice that the Mt. Crested Butte Planning Commission will hold a public hearing on Wednesday, November 18, 2009 at 5:00 p.m., in the Council Chambers, Municipal Building, Mt. Crested Butte, Colorado. The purpose of the hearing is for public input on a conditional use application submitted by Crested Butte, LLC allowing for the proposed use of a temporary yurt to be occupied by the Crested Butte Mountain Sports Team (CBMST) on Lodge Site 13 located at 650 Gothic Road. The use will be as a meeting/ locker/dressing room for all CBMST athletes and for administrative use by the CBMST staff. All interested persons are urged to attend. Written comments are welcome and should be received at the Town Offices, PO Box 5800, Mt. Crested Butte, CO 81225-5800 or by fax to (970) 349-6326 by Thursday, November 12, 2009. Application and site plan are available for viewing at Mt. Crested Butte Town Hall during regular business hours. Notice is hereby given that a proposed budget has been submitted to the Crested Butte Fire Protection District for the ensuing year of 2010. That a copy of said proposed budget has been filed in the office of the District Manager, 306 Maroon Avenue, Crested Butte, Colorado where the budget is open for public inspection. 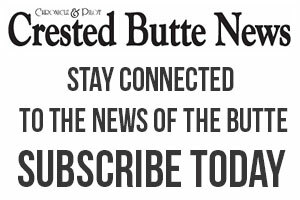 That said proposed budget will be considered at a regular meeting of the Crested Butte Fire Protection District to be held at the Mt. Crested Butte Fire Station, 751 Gothic Road, Mt. Crested Butte, Colorado on Tuesday, November 10, 2009 at 5 p.m.
Any interested elector within the Crested Butte Fire Protection District may inspect the proposed budget and file or register any objections thereto at any time prior to the final adoption of the budget. at 349-6632 at least 48 hours in advance of the meeting. Public comment on these agenda items is encouraged. This preliminary agenda is placed in the paper to notify the public of tentative agenda items for the meeting date above. The official posting place for the agenda is the bulletin board in the Mt. Crested Butte Town Hall entry. Please refer to that official agenda foe actual agenda items for the meeting date noted above. A) Changes to Butte Avenue and 7th Street (Poverty Gulch) Affordable Housing Guidelines. A) Approval of Minutes of October 19, 2009 Regular Council Meeting. B) Approval of Minutes of October 26, 2009 Special Council Meeting. 7:05 3) Public COMMENTS Citizens may make comments on items not scheduled on the agenda. Those commenting should state their name and physical address for the record and limit comments to five minutes. A)Special Event Liquor License – Crested Butte Nordic Center Annual Silent Auction and Gourmet Dinner – 401 Sopris Avenue (Queen of All Saints Parish Hall) – 6 p.m. to 10 p.m. on November 28, 2009 (public hearing). B) Ordinance No. 13, Series, 2009- An Ordinance Amending the Model Traffic Code To Permit The Use of Snow Cats on Town Streets Where Certain Conditions Are Met (public hearing). C) Ordinance No. 12, Series 2009- An Ordinance Adopting the 2009 Revised Design Guidelines, Town of Crested Butte (public hearing). D) Ordinance No. 16, Series 2009- An Ordinance Amending the Building Requirements for the “R2” Residential District to Clarify the Maximum Floor Area Ratio for All Buildings (public hearing). E) Ordinance No. 17, Series 2009- An Ordinance Amending the “B3” Business District Requirements to Allow Bed and Breakfasts as Conditional Uses and Amending the Parking Requirements for the “B3” Business District to Require That Bed and Breakfasts in the “B3” Business District Provide On Site Parking (public hearing). A) Consideration of Revocable License Agreement for 330 Belleview Avenue. B) Approval of Grubstake Building Condominiums Map and Declarations. C) Consideration of Amending Letter of Support for the Hidden Gems Wilderness Areas Proposal to Include an Additional Area. D) Resolution No. 13, Series 2009 – A Resolution To Adopt The Mill Levy For The Town Of Crested Butte, Colorado For The Fiscal Year 2010, Beginning The First Day Of January 2010 And Ending The Last Day Of December 2010. E) Resolution No.14, Series 2009- A Resolution Adopting The Budget And Appropriating Sums Of Money For The Town Of Crested Butte, Colorado For The Fiscal Year Beginning The First Day Of January 20010, And Ending The Last Day Of December 2010, Estimating The Amount Of Money Necessary To Be Derived From Revenue Sources, And Setting Forth The Total Estimated Expenditures For Each Fund. F) Ordinance No. 18, Series 2009 – An Ordinance Amending Section 13-1-110 Of The Crested Butte Municipal Code By Increasing The System Development Fees, Otherwise Known As “Tap-In Fees,” To $8,000 Per EQR For Water And $8,000 Per EQR For Sewer. G) Ordinance No. 19, Series 2009 – An Ordinance Amending Section 4-2-90 Of The Crested Butte Municipal Code By Decreasing The Vendor’s Fee On Collection Of Sales Tax From 3 ⅓ Percent To 1½ Percent. H) Resolution No. 15, Series 2009-A Resolution Amending Resolution No. 5, Series 2006 (Support for Public Property for the Purposes of Expansion of Arts Facilities) to Remove therefrom Reference to the Gothic Field as an Appropriate Location for Expansion. A) Ordinance No. 15, Series 2009-An Ordinance Amending the “C” Commercial District Requirements to Allow Medical Marijuana Dispensaries as Conditional Uses and To Adopt Regulations for the Permitting of Medical Marijuana Dispensaries in Such District. B) Staff Report on Proposed Covered Bicycle Parking at the Visitor Center. • Monday, November 2, 2009-8 a.m. Coffee with the Council-Izzy’s. • Monday, November 2, 2009-6 p.m. Work Session and 7 p.m. Regular Council Meeting. • Monday, November 16, 2009-8 a.m. Coffee with the Council-Izzy’s. • Monday, November 16, 2009-6:00 p.m. Special Council Meeting and 7 p.m. Regular Council Meeting (seating of new council members). • Monday, December 7, 2009-8 a.m. Coffee with the Council-Izzy’s. • Monday, December 7, 2009-6 p.m. Work Session and 7 p.m. Regular Council Meeting. –If you need special assistance to attend any of the Town’s public meetings, please notify the Town Clerk at 349-5338 at least 48 hours in advance. TUESDAY, NOVEMBER 3, 2009 ~ 6:00 P.M.
6:00 – Public Hearing – Ordinance No. 4. Series 2009 – An Ordinance Establishing The Minimum Regulations Governing The Conditions And Maintenance Of All Property, Buildings And Structures; By Providing The Standards For Supplied Utilities And Facilities And Other Physical Elements And Conditions Essential To Ensure That Structures Are Safe, Sanitary And Fit For Occupation And Use; And The Condemnation Of Buildings And Structures Unfit For Human Occupany And Use And Demolition Of Such Structures; Known As The Building Code By The Adoption By Reference Of The 2006 International Building Code, Chapters 1 Through 35 And Appendices B Through C And E Through G And I; Adoption By Reference Of The 2006 International Residential Code, Chapters 1 Through 24 And Chapter 41 And Appendices A Through H And Appendices J Through O; Adoption By Reference Of The 2006 International Mechanical Code, Chapters 1 Through 15 And Appendices A And B; Adoption By Reference Of The 2006 International Fire Code Chapters 1 Through 45 And Appendices A Through C And Appendices E Through G; Adoption By Reference Of The 2006 International Fuel Gas Code, Chapters 1 Through 8 And Appendices A Through D; Adoption By Reference Of The 2006 International Energy Conservation Code Chapters 1 Through 6; Adoption By Reference Of The International Property Maintenance Code; Chapters 1 Through 8; Adoption By Reference Of The International Existing Buildings Code; Chapters 1 Through 15, And Appendix Chapter A, And Chapters A1 Through A5, And Appendices A And B And Resource Chapter A; The Adoption By Reference Of The National Green Building Standards, I.C.C. 700-2008, Chapters 1, 2, And 7; Adoption By Reference The 2007 Supplement To The International Codes; Adoption By Reference Of The American Society Of Mechanical Engineers Standards A 17.1 And All Its Appendices, 2007 Edition; A17.3 And All Its Appendices, 2005 Edition; A18.1 And All Its Appendices, 2005 Edition; And Adoption By Reference Of The Americian Society Of Civil Engineers Standard A 21-96, 1997 Edition; Providing Penalties For The Violation Thereof; And Repealing Ordinance No. 2, Series 2007, Of The Town Of Mt. Crested Butte, Colorado And All Other Ordinances And Parts Of Ordinances In Conflict Herewith.